This book was recommended to me as the “Bible” for interaction design. I am in the midst of changing my career focus and doing more designerish work. I am not sure exactly where my new job will lead me, but I figured reading “Designing for the Digital Age” could give me a head start. I read this book using Safari Books Online and bought a physical copy from Amazon. The physical copy was because I figured I could read it faster if I had both electronic and print versions. After reading this book I have to agree that it could be the Bible of interaction design as it appears to cover every topic of modern design. But overall I found the book hard to read, repetitive, and very textbook like. I think I would have gotten a lot more out of it with the help of a classroom setting, which is a very rare thing for me indeed as I do not enjoy structured learning at all. I rate this book a 6 out of 10 because of its textbook like nature, but the information in the book is very valuable and I am glad that I have read it. I listened to this book from Audible, it is narrated by James Marsters. Side Jobs is a collection of short stories that take place between the other books in the Dresden Files series including a story from before Dresden has a P.I. license. I really enjoyed every one of these stories as they lend further depth and breadth to the characters I have grown to love. James Marsters gives an amazing performance portraying not only Harry as a lead role, but also Thomas and Murphy in their own stories. Mr. Marsters is an incredible actor! The publisher does not appear to have a synopsis for this book, but the editorial reviews on Amazon do a good job. I rate this book an 8 out of 10 overall, but a must read for Dresden fans. I read this book using Safari Books Online using an iPhone and a MacBook Pro with Firefox. I was most comfortable reading on a 22" screen rotated vertically so that I could easily read an entire page without scrolling with a font large enough to read while sitting back in an office chair. "Rocket Surgery Made Easy" is about doing usability testing with a small budget, little time, and not a lot of support. I think it does a great job fulfilling that purpose and more. It is very focused and does not stray from the subject it covers. I feel empowered by what I have learned and have a lot more confidence that I will be able to conduct usability tests that will result in knowing what should be worked on next. This is a short book compared to others on the market; in fact I read this book as a break from reading another much larger and broader-in-scope book. By paring the process of testing and fixing products down to its essentials (A morning a month, that’s all we ask ), Rocket Surgery makes it realistic for teams to test early and often, catching problems while it’s still easy to fix them. Rocket Surgery Made Easy adds demonstration videos to the proven mix of clear writing, before-and-after examples, witty illustrations, and practical advice that made Don’t Make Me Think so popular. I rate this book a 9 out of 10 for those interested in usability testing. I bought this book as a hardcover from Amazon along with "I Shall Wear Midnight" which I hope to read soonish. I absolutely love everything Terry Partchett. The Discworld series is so incredible with its depth and breadth of characters, locations, plot-lines, and pure awesomeness. I have read all of them multiple times. 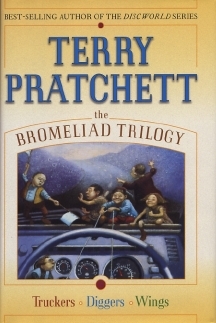 Terry Pratchett also writes amazing children’s books like the Tiffany Aching series, which takes place in the Discworld universe, "Nation", the award winning "The Amazing Maurice and His Educated Rodents," and "The Bromeliad Trilogy." The "The Bromeliad Trilogy" consists of "Truckers," "Diggers" and "Wings" which are adventures of the "nomes," little people similar to garden gnomes but don’t dare say that to them. The powerful conclusion to the trilogy, wherein the nomes search for a way back to their original home and learn more than they ever could have imagined about airports, humans, outer space, geese, and Floridian sandwiches. I rate this book a 7 out of 10, it is not as fast a read as most Discworld books, but it a satisfying story full of Terry Pratchett’s unique sense of humor.